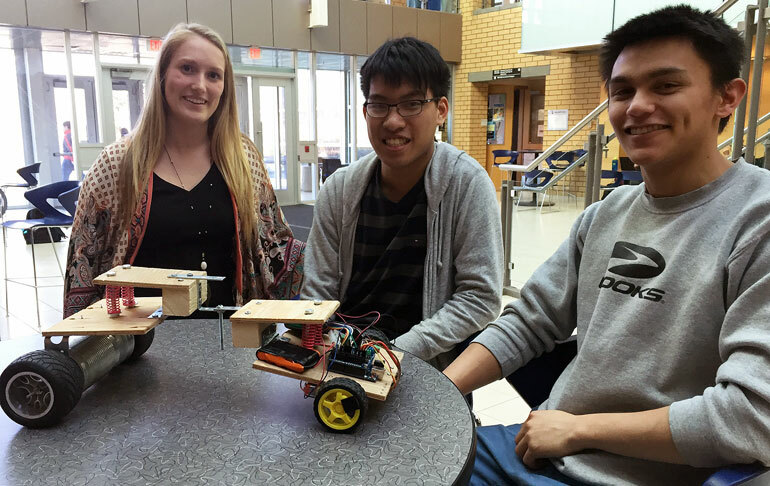 Second-year School of Engineering students Kaitie, Darryl, and Peter put the finishing touches on their Mars Lander that will be tested at the year-end competition Friday morning. As the academic year winds to close, students at UBC Okanagan’s School of Engineering are gearing up for a busy final week of projects and presentations. Along with reports and studying for final exams, the students are also responsible for either a capstone (final year) presentation or being part of a team of first-year students that have been tasked with designing a model Mars lander. The public is welcome to visit campus during any of these events and get an idea of some of the on-going projects in the School of Engineering. When: Friday, April 1 from 8 a.m. to 1:30 p.m. The School of Engineering showcases the results of the integrated second-year design project this Friday. The goal for students is to construct a Mars Lander. During the event competition, the autonomous vehicle is dropped from a height of one meter and will follow a line of tape along the foyer of the EME building. Different size nuts along the path need to be picked up and sorted into bins on the vehicle. At this event, the landers will be evaluated by engineering faculty for speed and the ability to accurately pick up and sort the nuts along the path. This is a fun event where parents and the public are encouraged to attend and cheer for their teams. When: Monday, April 4 from 10 a.m. to 2 p.m. The School of Engineering showcases the final design projects of the first-year engineering class. Students had a choice of three projects: one suggested by UBC faculty and two ideas from Clubhouse Farm. Student teams and their projects will be judged by faculty and prizes are awarded. When: Wednesday, April 6, 1 to 5 p.m.
Fourth-year engineering students will showcase the results of their final year Capstone Design Projects in a public poster presentation session. Many of these interesting and challenging projects were proposed by local industry collaborators and topics range from many different areas, including sustainable building materials, solar powered roadways, pipeline integrity sensors, inspection robots for power line towers, and much more. The event is open to the public, and local industry is encouraged to attend.